Tarhong Properties purchased a building in Stafford, on the southwest side of Houston. Photo: Colliers International. STAFFORD, Texas — Capital Plastics International sold its 70,000-SF office/distribution building on Cash Road in Stafford to Tarhong Properties. Jim Pratt and Trey Erwin of Colliers International represented Capital Plastics. Michael Brent with the City of Industry, California Lee & Associates office represented Tarhong Properties. 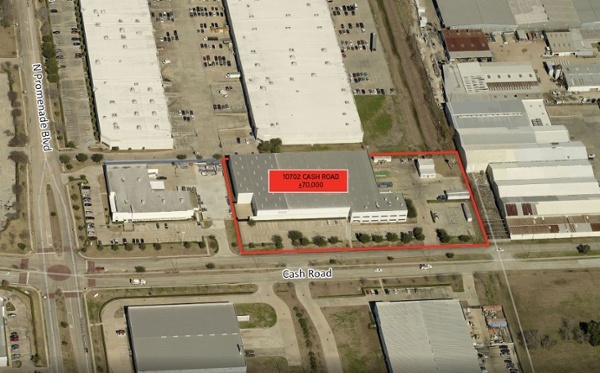 Capital Plastics is relocating to 1601 Gillingham Lane in Sugar Land, a 330,000-SF building it purchased earlier this year from Dalfen America Corp.
10702 Cash Road is a 70,000-SF, freestanding tilt-wall building with approximately 10,000 square feet of office space. Built in 2005 and expanded in 2006, the building sits on 3.6 acres and is fully fenced with an access gate. The property is located in the City of Stafford Freeport Trade Zone with easy access to Highway 90A, Highway 59, and Beltway 8.